HomeResourcesWhat does an Audio Mixer Do? | CUTTING THROUGH THE CONFUSION! This is part 8 in a series on various studio equipment, what it does, and how to choose! Before we get into the question of What does an audio mixer do?, grab a snack, sit back and relax because.. When getting down to brass tacks, it can be a little confusing trying to figure out what exactly a mixer does. We’ve all seen them before. Seemingly endless amounts of knobs on a big box. In reality, one channel strip of these repeats depending on the amount of channel inputs you have. In essence, if you know what one single group of knobs and faders does, you’ll understand a mixer as a whole is just duplicates of that one channel strip. More on that later. 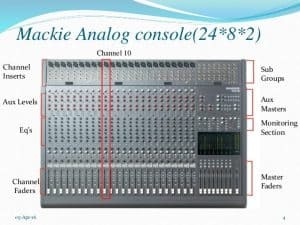 To understand a mixer’s function, we need to realize that it’s primary job is to manage sound, whether that be a live recording or an in studio recording. In complete layman’s terms (which I myself find mandatory), it brings all the parts of an audio performance together, blending and processing them so the sound is coherent and of a high quality. 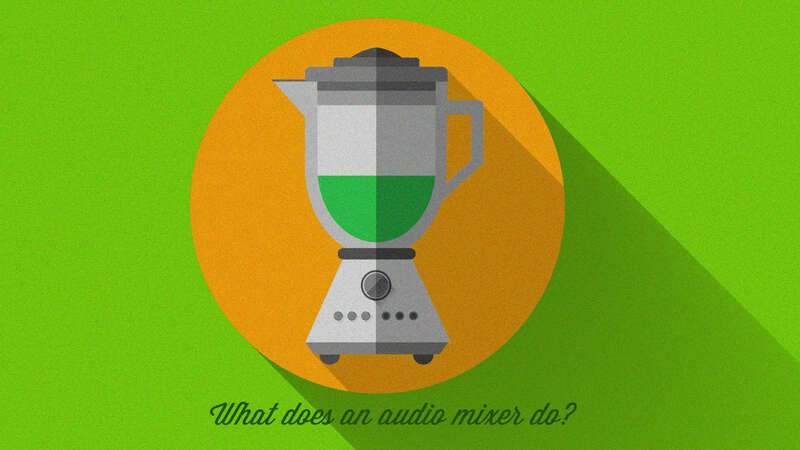 Further, a mixer takes two or more audio signals (from a microphone, amp, etc. ), and merges them together to create one or more output signals. In essence, it allows you control over your environment with the goal of ensuring that each individual sound is in harmony with one another. The number of inputs will vary from mixer to mixer, and generally the cheaper ones will have a lot less. If you were to mike a band, you’d need at least 8 channels to pick up the entire drum kit. Just think of a channel as a signal path. 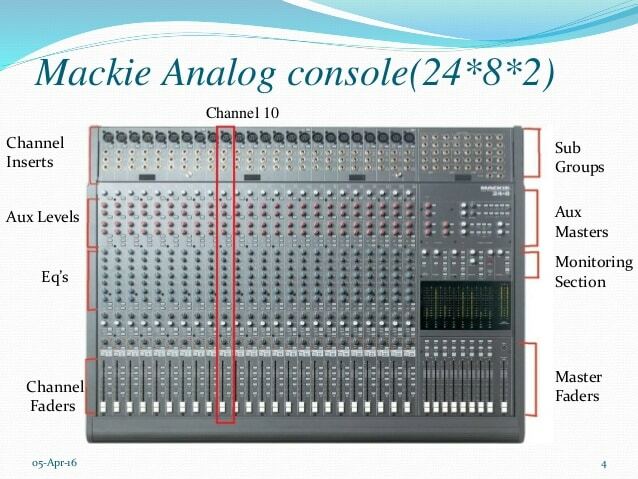 The amount of channels a mixer has determines how many different instruments can be used. A channel can be used with microphones and or line level stuff such as amplifiers, preamps, and signal processors. Microphones, guitars, and bass have a lower level than line-level, and use a preamp to boost the signal to a listenable level. The video below is part of a playlist including 17 different videos on Mixers. I highly recommend you check some of them out, as they’re extremely helpful and easy to understand! A channel strip is a type of signal processor with additional ways to improve the quality of your sound. A single rack channel strip is the most common for beginners. There are also solid state channel strips, which add a dimension of clarity and transparency, or tube channel strips which add more warmth. It’s very similar to a Tube amp vs. solid state. They both provide different effects. For example, a rapper, musician, or voice-over artist who does a lot of podcasting type stuff may find a channel strip very useful. Instead of having to edit out misc. sounds, compress, and remove weird breathy type of noises after the fact, you could simply use a channel strip and have the flexibility of being very hands on with it before it gets recorded. Your microphone hooks up to the channel strip via an XLR cable. You plug that XLR cable from your mic into the mic input on the strip. Then, you would use another 3 foot XLR male to 1/4″ TRS male. TRS vs. TS. Plug the TRS end into the line output jack on the strip, and then plug the XLR end into your audio interface. I use the Focusrite Scarlett 2i2, but your mileage will vary. What is XLR? Your audio interface then plugs into your PC or laptop via USB. an example of a channel strip. EQ, to adjust the frequency response. Compression/Gating, to minimize the amount of extraneous noise that gets processed. Routing, which directs the signal to other devices. A Fader, which is basically a volume control. All of these things in conjunction with one another help you to make the recorded signal as clean and loud as possible. That said, a channel strip on a mixer would be the example pictured to the right. A bus is a path that you can use to combine multiple instruments or sources to be processed. An example would be taking all of the drum sounds in a kit and combining them in one place for further processing (Compression, EQ, etc). This would be called a Drum Bus. The output of the drum bus would then be routed to the Master Bus. The Master is the one that combines all the sounds into a single stereo track. You can use this concept and apply it to a bus consisting of guitars, and another one consisting of vocals. An auxiliary send is basically just another type of bus, in which a copy of the signal can be sent to other effects processors outside of the mixing board. As an example, you may want to add some effects to a guitar, so you would send it through an auxiliary to a reverb unit. The signal would then get sent back to the mixing board into separate input channels. Pre-fader. This makes it so the channel output fader at the bottom of the channel strip doesn’t affect the signal that’s sent through the auxiliary send. It’s useful for musicians who want to record a new part of the song but not affect the other parts. Post-fader. This makes it so the channel output fader does affect the signal level going through the aux send. This is common when you’re using an effects unit, as you can control the amount of signal with the fader. EQ is probably the most well known component of a hardware mixer (behind faders), as well as various software programs like Fruity Loops, Reason, Pro Tools, etc. It acts as a correction tool, allowing you to adjust the frequency spectrum to your liking. This basically means you can mess with the Bass, mid-range, and treble, and shape them to suit your specific tastes. This basically allows you to direct the sound from left to right, and becomes useful in creating instrument separation and a sense of Soundstage. What is Soundstage? These might not appear on all mixers, but are all equally as important. Gain level. The volume control for each channel. Pad or Passive attenuation device. Simply cuts a specific amount of dB off of the signal, making it quieter. These are also common in microphones to cut the signal if need be. Phase Reversal. A polarity reversal of the signal, shifting a complex wave form by exactly 180 degrees. I talk a bit about this in How do noise cancelling headphones work?? Phantom Power. This boosts your condenser microphones signal to a listenable level. You won’t need it for Dynamic mics however. Condenser mic vs. Dynamic mic. Mic/Line. Differentiates between XLR or 1/4″ TRS connections. Mic is usually XLR, while TRS is for instruments. An analog mixer is very hands on and intuitive, as you can control all of the knobs, buttons, and faders live. The downside of an analog mixer is that they take up a lot of space, which can be a disadvantage if you’re working in a smaller studio type of environment. A digital mixer has the capability of storing specific mixes from previous venues or sessions via USB, or internal memory. You’re also able to make changes to the signal very instantaneously via an array of effects and other software plug ins. With a digital mixer, you have better control over EQ, compression, and gating, etc. We touched a little on software mixers, which is what I have used for a long time. These save a ton of space, and can be found on nearly every program that you come across. Because I am primarily a sample based producer, the flexibility of using software for virtual instruments, samples, drum loops, etc. is invaluable. There are other types of mixers, but for the purposes of this article the 3 above are the main ones to be concerned with. If you need a simple channel strip that has the ability to improve the quality of your recordings instantaneously, I highly recommend the DBX 286X channel strip. You won’t even need Acoustic Sound Treatment with this puppy! Did I answer your question? I would love to hear from you! Until next time..